4 chairs 19 inch W x 19 inch D x 35 inch H. 1 round table 47 inch x 29 inch H. Seat Dimensions: 16 W x 17 D x 17 H.
A bit dressy and classic, the Cuba set offers the restaurant benches conviviality at home. The benches comfort is evident and invites to sit. Simply perfect. The Cuba 3 pieces set includes two benches with cushion and one rectangular table 30x 51. This 5-piece patio dining set includes 4 sling-back steel folding chairs with arms and 1 steel glass top table. The sling-back chairs is made from UV-resistant material for protection from the sun. With a dark brown finish and a light brown sling-back seat this dining set will complement many exterior decors. 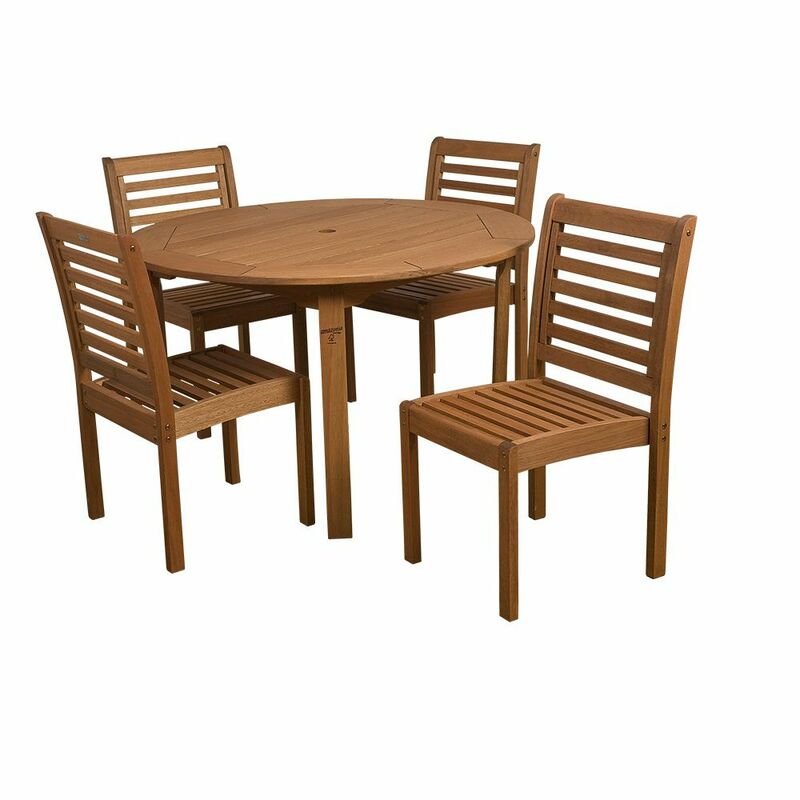 This dining set makes the perfect place to convene with friends and family on beautiful summer evenings. Eucalyptus 5-Piece Patio Dining Set The Amazonia Collection is committed to providing premium quality sets with an elegant design that will make your home stand out above the rest. Crafted from solid Eucalyptus Grandis wood, grown in 100% managed forests in Brazil and certified by the FSC (Forest Stewardship Council), this eucalyptus furniture is known for its longevity and craftsmanship at an affordable price. Enjoy your patio in style with these great sets from our Amazonia Collection. Eucalyptus 5-Piece Patio Dining Set is rated 5.0 out of 5 by 4. Rated 5 out of 5 by HomeDepotCustomer from It’s perfect! It was easy to assemble and set up.... It’s perfect! It was easy to assemble and set up. It was harder to get out of the box than anything else. It fits perfectly in the space I had wanted to place it! Great investment! Rated 5 out of 5 by MM from Great patio set Home Depot had the best price on this set by far. Super quality. Rated 5 out of 5 by Lkymma9 from Great Patio Set! This was so easy to build using the supplied Allen wrenches once I figured out the perfect alignment for the chair parts :) Color is beautiful and size is perfect for a small backyard. The chairs stack nicely to get them out of the way for yardwork.